What Are We Going To Discuss Today? 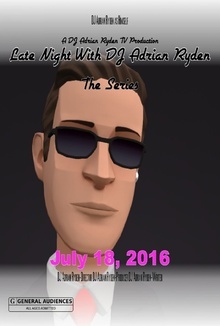 Late Night With DJ Adrian Ryden is your typical talk show only it's animated. In Late Night With DJ Adrian Ryden your host sits down with maybe one or two guests each week to discuss their upcoming TV/Web Series. Also during Late Night With DJ Adrian Ryden your host will start out by learning a little bit about his guests then we will usually learn a little bit about the web series then we would usually get a taste of that web series by getting to see one or maybe two or maybe even three clips from that web series and then after that he would normally end the episode. So, without further ado sit back and relax and get ready for Late Night With DJ Adrian Ryden.